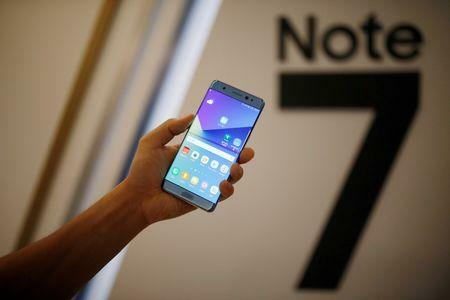 SEOUL/NEW YORK (Reuters) - A U.S. government safety agency on Friday urged all consumers to stop using Samsung Galaxy Note 7 phones, which are prone to catch fire, and top airlines globally banned their use during flights. Following reports that the phones' batteries have combusted during charging and normal use, the U.S. Consumer Product Safety Commission said it was working on an official recall of the devices and that users should turn them off in the meantime. Samsung Electronics Co Ltd <005930.KS> said it was working with the agency and asked customers to immediately turn in their Note 7 phones. It voluntarily issued a recall last week for 10 markets, including South Korea and the United States, and it said it was expediting shipments of replacement phones to customers in the United States. Some analysts say the recall could cost Samsung nearly $5 billion in revenue, after accounting for expenses from the recall process. For Samsung, which prides itself on manufacturing prowess, the scale of the recall is expected to be unprecedented. Some 2.5 million of the premium devices have been sold worldwide, the company has said. Its shares closed down 3.9 percent on Friday. In a separate statement on Saturday, Samsung asked consumers in South Korea to discontinue the use of their Galaxy Note 7 phones and visit one of the company's service centers for the recall process. "The cost of the recall is going to be astronomical," said product liability expert and chief executive officer of Real-World Forensic Engineering, Jahan Rasty. "They have to compensate people, fix the problem and give them a revised version of the product that doesn't have the same manufacturing or design defect. "The longer this story lingers, the more it will etch itself in people's minds," he said. Aviation authorities and airlines from North America to Europe and Asia have issued bans or guidance on the phones. On Thursday, the U.S. Federal Aviation Administration (FAA) said travelers should not use or charge them while in the air, or stow them in checked luggage. South Korea made similar recommendations on Saturday. The FAA's action prompted the world's three largest airlines by passenger traffic - American , Delta and United - to start telling passengers at the gate and on board aircraft to keep the phones switched off until they deplane. That's because airlines have increasingly made movies and TV shows available free for streaming on smart devices in flight, to avoid the cost of installing new screens on seat-backs. For now, Note 7 customers are cut off from this entertainment. This is "a huge black eye for Samsung", TECHnalysis Research President Bob O'Donnell said. Companies ranging from Singapore Airlines Ltd and Qantas Airways Ltd to Air France KLM SA have instituted similar bans on the device. Top airlines banned hoverboards during the Christmas holiday season in 2015. Earlier this year, the U.N.'s aviation agency prohibited shipments of lithium-ion batteries as cargo on passenger planes.